The River Lodge at Thornybush is a sanctuary of comfort and a luxurious safari base in the 14 000-hectare Thornybush Private Nature Reserve in Greater Kruger National Park where wildlife viewing is supreme. 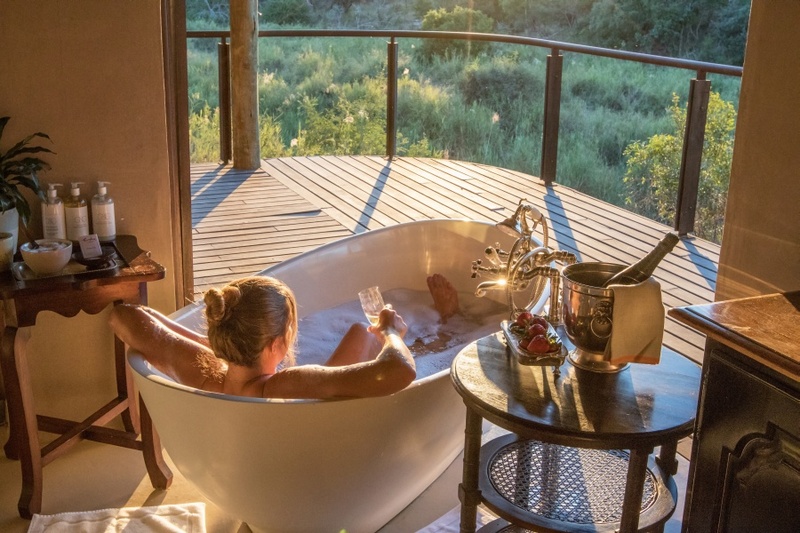 Three River Lodge Suites provide secluded wilderness havens, each suite with its own leisure deck complete with private pool and wilderness views. Bathrooms have glass stacking doors inviting in spectacular views to be enjoyed from Victorian bath tubs. An outside shower allows for an invigorating experience. Situated near a well-used elephant trail, the Honeymoon Suite is large and sumptuous, with a heated infinity pool and fireplace. The Royal Suite is a lavish 2-bedroom villa with teak deck and rim-flow pool, ideal for families or couples travelling together. At the central lodge a rim-flow swimming pool overlooks a waterhole that attracts a good deal of wildlife. Safari drives take place in the morning and evening each day, and there is also the option of guided walks. Stylish dinners are enjoyed on a lantern-lit deck under the stars. There's currently no specials at The River Lodge at Thornybush. All meals, teas, coffees & snacks. Dawn and dusk safaris in open land cruiser vehicles and bushveld walks. All Local drinks at Thornybush The River Lodge. Ask us about conference facilities in Thornybush Game Reserve. Facilities are available at The River Lodge at Thornybush for intimate bush weddings.